PETERSBURG, Va. — Police arrested three men and sought a fourth Tuesday after two Virginia State University freshmen were swept away while trying to cross a swift, rain-swollen river as part of an initiation rite. The body of one freshman, identified as Marvell Edmonson, 19, of Portsmouth, was recovered Monday. The search continued Tuesday for the second, Jauwan M. Holmes, 19, of Newport News. 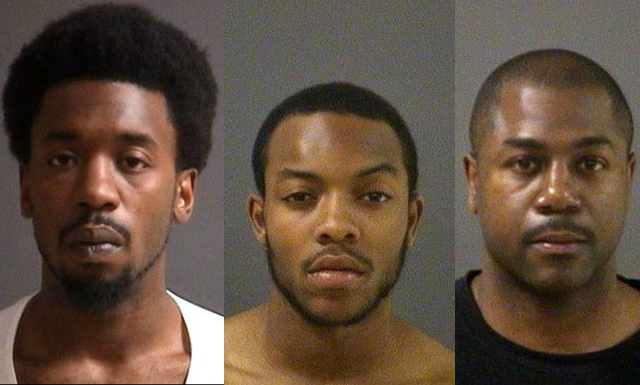 The four suspects are connected to an organization known as “Men of Honor” that conducted an initiation Saturday that required seven male VSU students to walk through the rushing rapids of the Appomattox River, police said. While some were pulled to safety, two were swept away. Chesterfield County police identified the three in custody as James A. Mackey Sr., 35, of suburban Richmond; Eriq K. Benson, 19, of Quinton; and Cory D. Baytop, 26, of Newport News. Each has been charged with five counts of hazing. Police were seeking Charles E. Zollicoffer II, 29. An address was not provided. Benson and Baytop are VSU students. Benson’s attorney did not immediately return a telephone message. It was not clear if the other suspects had attorneys. Police Lt. Randy Horowitz described Men of Honor as a social club or “group whose mission is to build the character of young men.” He said he was not familiar with the organization beyond that, and said it was not sanctioned by VSU. University spokesman Thomas Reed said Men of Honor was not affiliated with VSU and he could provide no additional information on it. Students are provided with information about sanctioned groups on the campus, he said. Reed declined to discuss the arrests or the two students accused, citing the investigation. He acknowledged that the school has had problems with hazing in the past and has taken steps to eliminate it. In April, the president of the student government association was charged with hazing related to an incident off campus in neighboring Petersburg in August 2012. In 2009, six VSU students and two nonstudents were accused of hazing after another student sought medical treatment for severe bruising. In a plea agreement, the defendants agreed to prepare and present information sessions for students at VSU in exchange for the eventual dismissal of the charges. The historically black university has about 5,300 students in Ettrick, about 25 miles south of Richmond. This is beyond irritating to me. I was just having a conversation about hazing last night. Somehow folks have deemed it acceptable to be on both the giving and receiving end of hazing. Those on the receiving end have much more power than they realize to change this culture. This does not absolve the hazers of their wrong doing. I imagine it must be harder for males to buck the tradition, but it has to start somewhere.